Hello again! We hope you noticed that we took a break and gave you a break from the newsletter in August and September, but it's time to get back to business. We are glad that the steamy hot weather has once again departed and that ideal gardening weather is starting to make its way back to South Florida. So it's time to garden, garden, garden and get those outdoor spaces ready to be enjoyed during the upcoming cool evenings. Think about being outside in the evenings with no pesky mosquitoes, a light breeze and cool nights while barbecuing amidst fragrant and beautiful healthy plants. So we're here to nudge you to get your gardens ready by sharing monthly news, information, gardening tips, and sales. 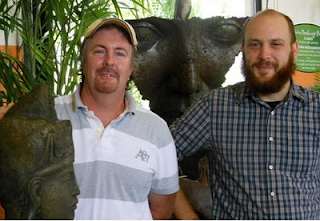 You will notice 2 new faces at SmartyPlants - Mike Matthews and Brandon Block. Mike comes to us with a degree in Landscape Design & Ornamental Horticulture and many years of experience in plants, landscaping, maintenance, and other plant related topics. You will see him on the sales floor, making unique and fabulous plant combinations and bonsais, or out in the field creating sustainable and interesting landscapes. Brandon brings much needed back-office and retail experience. He takes part in processing and maintaining our inventory, creating interesting and useful signage, and assisting with the myriad of tasks that have to be accomplished on a day-to-day basis. You will see him at the register or in one of the back offices working hard to keep the list of things to do to a minimum! Our Plant of the Month for October is the Croton linearis - Pineland Croton. 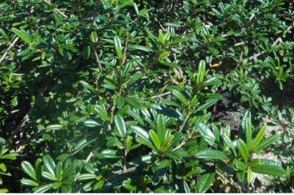 This evergreen shrub is native to the Pinelands of South Florida and the Keys. It can be kept short 3-4 ft. tall so its suited to be used as an accent plant or a hedge. Once established, it can survive without supplemental irrigation. Leaves have a silvery underside. 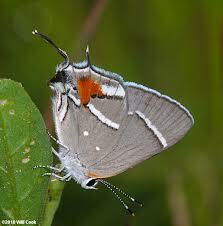 It produces an inconspicuous white flower most of the time which is a source of nectar for butterflies. It is the sole larval host plant for the Bartram's hair-streak butterflies in South Florida and a larval host plant for Florida leafwing butterflies. Gardenia - If you want your gardenias to flower next spring, please do not prune them until next summer. If you did not fertilize them yet at the end of summer, this is a good time to do it. They prefer a slightly acidic fertilizer, which of course can be purchased at SmartyPlants. Fertilize your garden - We've had and continue to have a hot wet period. If you fertilized at the beginning of the summer, it's time to fertilize your yard again. This application will get you through the next four months. We're not complaining about rain; it's a beautiful thing. But, it dissolves and dilutes the fertilizer plants need. You may also try a foliar spray to tie you over until later this season when we have drier weather. For an organic alternative to synthetic fertilizers, try compost or cow or hen manure, and/or compost tea as a soil drench and foliar spray. Ask us about choices when you come in. Herb and Veggies - Take advantage of the end-of-summer rains and start your vegetable beds. October is optimal for planting seeds for numerous herbs and vegetables. A short list includes beans, beets, broccoli, cabbage, carrots, cauliflower, celery, Chinese cabbage, collards, cucumbers, endive, herbs, kale, kohlrabi, lettuces, onions, peas, peppers, potatoes, radish, spinach, winter squash, tomatoes, and turnips. Due to susceptibility of tomato plants to nematodes, we recommend planting tomatoes in above-ground containers. Hibiscus Standards are 15% off. We have a beautiful selection of colors. Silver Buttonwood 15-gal. are 15% off. Great plant to create a screen or as an accent. Mike has created a number of interesting plant combinations in bowls and planters as well as unique ornamental topiaries. Did you always want to try a bonsai? Check out our new bonsai area. You will find some very unusual plants in bonsai form, like dwarf Oleander, Asoka, variegated Oleander, and dwarf Powderpuff. We enjoy being a partner in the community and helping you beautify your yard and your life.